Development of a hammertoe is a commonly encountered problem by the foot and ankle surgeon. In long-standing deformity, the pathologic toe becomes fixed with patient complaints of pain, corns, and calluses and, in the immunocompromised patient, ulceration with potential infection and amputation. A common correction of the deformity is through lesser toe interphalanageal arthrodesis, commonly performed at the proximal joint. There are numerous techniques and new devices on the market to help assist in holding position until fusion is achieved. The author demonstrates a case report utilizing a fixation device that has characteristics similar to that of an intramedullary rod. Additionally, a retrospective, observational study involving 35 toes that have undergone an arthrodesis procedure of the proximal interphalangeal joint using an intramedullary fusion device to stabilize the fusion site is reviewed. This device imparts its stability in a manner similar to that of intramedullary rods in long bone fixation. The hammertoe deformity is one of the most common presenting problems and surgical corrections encountered and performed by the foot and ankle surgeon [1,2]. Correction through lesser interphalangeal (proximal interphalangeal joint, PIPJ, or distal interphalangeal joint, DIPJ) resection and fusion was first described by Soule in 1910 . Since then many modifications have been made to the procedure from various methods of bone preparation at the fusion site to extramedullary (EM) Kirschner wires (KW) and intramedullary (IM) fusion devices (IMFD) to stabilize the fusion site until osseous healing has been achieved [1, 3-6]. The choice to adapt fixation from EMKW to IMFD buried inside the bone stemmed from the desire to improve surgical outcomes, namely decreasing surgical site infection (SSI) rates among other inherent problems with KW use . Since their introduction onto the market, many of these new have held true in decreasing these complication rates, achieving similar outcomes regarding fusion rates, with the bonus of higher patient satisfaction and a decreased (almost eliminated) infection rate [2, 7-10]. Here we present an example of an IMFD, different in construct than others on the market, which has not yet been reported on. This device gives another option to the surgeon when it comes time for digital fusion procedures with the added versatility of various lengths when multiple digital joints need to be fused simultaneously. The construct of this device, unlike others, garners its strength and stability from its length, purchasing the subchondral bone plate and acting in a manner similar to an intramedullary rod used in other orthopaedic fixations scenarios. Our patient, a 49 year-old female, presented with a chief complaint of a right second toe deformity. Conservative measures of strapping, padding, and shoe modifications were attempted, but ultimately failed. She elected to proceed with arthrodesis of the digit. She was followed at post-op weeks 2, 4, and 8. At week 8, osseous bridging was noted across the osteotomy site (Figure 1). The patient had no complaints and was discharged. She returned to the office 2 years later for a different complaint and x-rays revealed fusion across the PIPJ with no loss in hardware fixation (Figure 2). Figure 1 Case report patient at (left) 2 weeks and (right) 8 weeks post-operation. Note fusion on medial side of arthrodesis site at 8 weeks. Figure 2 Case report patient seen 2 years later. Complete fusion with no loss of fixation. A #15 blade is used to make an incision across the PIPJ of the digit. This is dissected down to the deep capsule taking care to create a surgical plane between the superficial and deep fascial layers. Retraction is utilized to protect neurovascular structures located around the digit. A transverse tenotomy of the long extensor is performed just proximal to the PIPJ and soft tissues are freed up from the proximal phalanx head and middle phalanx base. Cartilage resection is performed with a sagittal saw at the head of the proximal phalanx and base of the middle phalanx. Implantation of the IMFD is performed per the devices surgical technique guide. First, the IM canals of the proximal and middle phalanx are reamed with the supplied 1.6mm diameter reaming device down to but not through the subchondral plate into the adjacent joint. This position is checked on fluoroscopy and length is measured off of the wire, summing the proximal and middle phalanx measurements and choosing the sized implant available. Next the proximal phalanx is broached with the supplied 2.7mm broaching device. The depth of the broach is noted per the ruler on the device (7-10mm depth). The appropriate implant is positioned at the corresponding proximal phalanx reaming depth and placed within the proximal phalanx IM canal. The digit is then grasped and manipulated to place the distal end of the implant into IM canal of the middle phalanx. Once inserted, the implant can be released and the bones are manually compressed across the resection point. Closure consists of re-approximation of the extensor tendon and capsule around the fusion site for extra-medullary stability, and layered closure of the superficial fascia and skin. A CPT code audit of 28285 (correction hammertoe, eg. Interphalangeal fusion, partial, or total phalangectomy) from March 1, 2011, to July 15, 2015, was performed. Over that time period, the resulting search yielded 60 patients who had 89 digital surgeries. Patients that had arthroplasty, arthrodesis not performed with the studied device, the studied device plus KW, or isolated DIPJ arthrodesis were excluded. Ultimately, 35 toes in 23 patients had isolated PIPJ fusions using this technique. The case patient was seen at post-operation weeks 2, 4, and 8. Signs of fusion were noted at week 4 and complete fusion was noted at week 8 radiographically. No loss of fixation was noted at any point. Patient satisfaction was high at discharge. The CPT audit identified 35 toes that underwent PIPJ arthrodesis using the studied device. Average follow-up was 110 days. There was zero (0%) cases of hardware failure noted. In a single instance (2.8%), the device appeared to have rotated 90 degrees on its long axis, but fixation was still maintained. Two toes (5.7%) were misaligned with slight medial angulation of the digit. There were zero occurrences of either a superficial or deep incisional infection as defined by the CDC . No patient required revision surgery or a return to the operating room for a complication secondary to the index digital arthrodesis procedure. One of the biggest problems with arthrodesis of the PIPJ can be attributed to the use of EMKW for temporary stabilization across the fusion site until osseous union is achieved. The use of KW for fixation was first described by Taylor in 1940 . Since that time, surgeons have battled against the complications of this technique such as pin-tract infections, digital edema, delayed or non-union of the arthrodesis site due to lack of compression, rotational instability, bent or broken wires, and patient dissatisfaction and apprehension due to the protruding wire and its impending removal [2,10]. External wire exposure infection rates range from 0-18% [1,5,12]. Studies have reported 40% of the wire infections were related to external factors through irritation at the skin-pin interface secondary to trauma and water-contamination . Because of this, Creighton et al (1995) first presented a new technique of the single buried KW in digital fusion . In more recent times, various IMFDs have been manufactured to give the surgeon options of fixation other than the aging gold standard KW. Canales et al (2014) in a recent paper noted 68 IMFDs on the market as of February 1, 2014 . Normal incidence of surgical site infection after foot and ankle surgery has been reported between 1% and 5.3% [13, 14]. Creighton et al (1955) reported an infection rate of 3.5% with his buried KW technique while more recent fusion products have reported similar results ranging from 0%-5% [2,5,7,10]. Our results were similar with a 0% superficial or deep infection rate for the 35 toes at average patient follow-up of 110 days. No patient at any point or length of follow-up presented for care of digital infection. One such product for IM digital fusion is the Arrow-LokTM Hybrid implant (Arrowhead Medical Device Technologies, LLC., Collierville, TN) and is the specific implant used by the senior author and reviewed in this article. The implant is made of one solid piece of ASTM F-138 stainless steel, has a core diameter of 1.5mm (0.059”) with a proximal 3-dimensional (3-D) barbed arrow-shaped head 3.0mm by 3.5mm or 2.5mm and distal 3-D arrow-shaped head 3.0mm by 3.5mm. It comes in variable lengths ranging between 13mm and 50mm and in 0° and 10° plantar bend angles [15-17] (Figure 3). There is no special handling or pre-operative storage restriction placing a handling time limitation on implementation . Its use in various clinical situations (PIPJ and DIPJ arthrodesis) as well as surgical tips and tricks have been published on, but to the authors best knowledge no literature exists on loss of correction and infection rates [15,18]. Figure 3 Intramedullary fusion device comes in straight (top) or 10° angulation (bottom). Key regions include (A)overall length, 13-50-mm; (B) distal tip diameter, 3.5-mm; (C) proximal tip diameter, 2.5-mm or 3.5mm; (D) length of proximal angle segment, variable 6-9-mm; (E) length of proximal angle segment, variable 10-26-mm. The theory of construct of the ArrowLokTM is similar to that of an intramedullary rod (IMR) in fracture care (Figure 4). One of the biggest benefits of the ArrowLokTM device is due to the various available lengths ranging from 13mm to 50mm, the largest identifiable span on the market. Both transfer loads across a break in long bones, whether it be a fusion (ArrowLokTM) or fracture (IMR) site . This IM position is closer to the anatomic axis of the bone and aids to resist bending while the circular round construct resists loads equally in all planes. Mechanical load testing at a quarter of a million cycles at up to 89N showed no signs of wear or fatigue of the ArrowLokTM or bone . Furthermore, in instances where both PIPJ and DIPJ fusion is needed, one longer device can be used versus two separate devices to be squeezed into a tight space . This results in a location of potential stress riser in the middle phalanx between the distal and proximal ends of the two implants as described in the above situation. This is important when a common results regarding digital fusion (either implanted devices and percutaneous k-wires), the bulk of the non-osseous fusions are made up of fibrous unions which rarely impact the outcome of the surgery and are still considered a surgical success [7,8]. When osseous fusion is not achieved and weaker fibrous tissue fills the fusion interface, much of the strength of the fusion lies in the inherent strength of the implant device. Figure 4 Like an IM rod (left), the ArrowLokTM device (right) garners its strength through its length spanning the osteotomy site to transfer loads and end arrow tips acting as a locking screw, preventing rotation, shortening and gapping, all reasons for failure of fixation. Figure 5 DIPJ arthrodesis with the ArrowLokTM device. The 3-D arrow-ends of the ArrowLokTM act similar to proximal and distal locking screws in IMRs. This secures the device and prevents rotation, compression, shortening, or gapping, resulting in loss of fixation. Compared to a standard 1.6mm (0.0062”) EMKW, the ArrowLokTM has comparable resistance to bending, increased resistance to pull-out (21x more resistant), and increased resistance to rotational forces (12x more resistant) . These problems are inherent to EMKW use due to the design lacking IM compressive purchase and inability to prevent rotation, leading to potential non-solid fusion and mal- or non-union. IMRs bending rigidity is based off of diameter and in solid, circular nails, is proportional to nail diameter to the third power . Diameter also affects nail fit with a well fitting nail, reducing movement between the nail and bone, friction between the two maintaining reduction . Reaming with the initial KW and broach help increase this contact relationship. With a 1.5mm core diameter, the ArrowLokTM is a tight fit within the phalangeal canal and increases bending rigidity and construct strength. The long, solid, one-piece design differs from others on the market in not having regions of thinner diameter metal and having two pieces that snap together at the junction of the fusion site – both which lead to sites of potential breakdown . 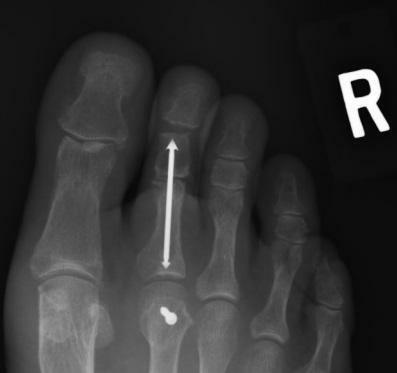 One study demonstrated a 20.7% rate in fracture at internal fixation site using Smart Toe® (Stryker Osteosythesis, Mahwah, NJ) versus 7.1% in 0.062-inch buried IMKW use . 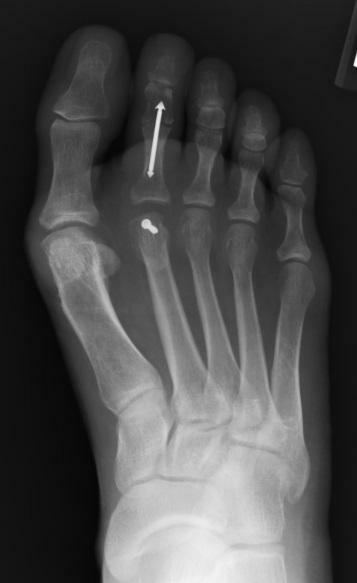 The recent literature has demonstrated that utilization of these newer devices like the ArrowLokTM for correction of the hammertoe deformity provide a safe method with low complication rates similar to other products on the market.8 Furthermore, with the decrease and almost elimination of infection rates, despite the higher cost of the implant compared to a KW, the potential for infection complications and the associated cost is avoided. In our retrospective case review, ArrowLokTM showed a lack of hardware failure, zero infection rate, and high patient satisfaction. Due to its available lengths, IMR type construct, and ability to cross two fusion sites at once, this device offers another option for the surgeon in digital fusion. Dr. Jason R. Miller is a consultant for Arrowhead Medical. Arrowhead Medical Device Technologies had no knowledge or influence in study design, protocol, or data collection related to this report. Zelen CM, Young NJ. Digital arthrodesis. Clin Podiatr Med Surg. 2013;30(3):271-282. doi:10.1016/j.cpm.2013.04.006. 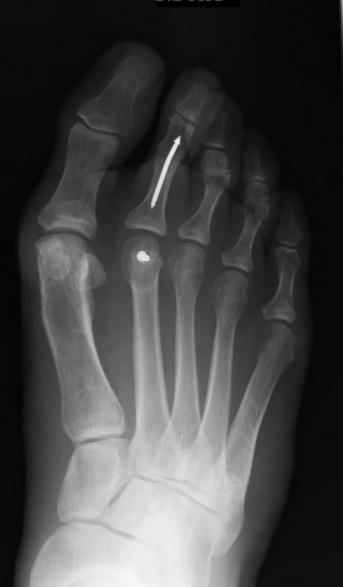 Angirasa AK, Barrett MJ, Silvester D. SmartToe® implant compared with kirschner wire fixation for hammer digit corrective surgery: a review of 28 patients. J Foot Ankle Surg. 2012;51(6):711-713. doi:10.1053/j.jfas.2012.06.013. Lamm BM, Ribeiro CE, Vlahovic TC, Bauer GR, Hillstrom HJ. Peg-in-hole, end-to-end, and v arthrodesis. A comparison of digital stabilization in fresh cadaveric specimens. J Am Podiatr Med Assoc. 2001;91(2):63-67. Miller JM, Blacklidge DK, Ferdowsian V, Collman DR. Chevron arthrodesis of the interphalangeal joint for hammertoe correction. J Foot Ankle Surg. 2010;49(2):194-196. doi:10.1053/j.jfas.2009.09.002. Creighton RE, Blustein SM. Buried kirschner wire fixation in digital fusion. J Foot Ankle Surg. 1995;34(6):567-570; discussion 595. doi:10.1016/S1067-2516(09)80080-X. Canales MB, Razzante MC, Ehredt DJ, Clougherty CO. A simple method of intramedullary fixation for proximal interphalangeal arthrodesis. J Foot Ankle Surg. 2014;53(6):1-8. doi:10.1053/j.jfas.2014.03.017. Basile A, Albo F, Via AG. Intramedullary fixation system for the treatment of hammertoe deformity. J Foot Ankle Surg. 2015:1-7. doi:10.1053/j.jfas.2015.04.004. Catena F, Doty JF, Jastifer J, Coughlin MJ, Stevens F. Prospective study of hammertoe correction with an intramedullary implant. Foot Ankle Int. 2014;35(4):319-325. doi:10.1177/1071100713519780. Scholl A, McCarty J, Scholl D, Mar A. Smart toe® implant versus buried kirschner wire for proximal interphalangeal joint arthrodesis: A comparative study. J Foot Ankle Surg. 2013;52(5):580-583. doi:10.1053/j.jfas.2013.02.007. 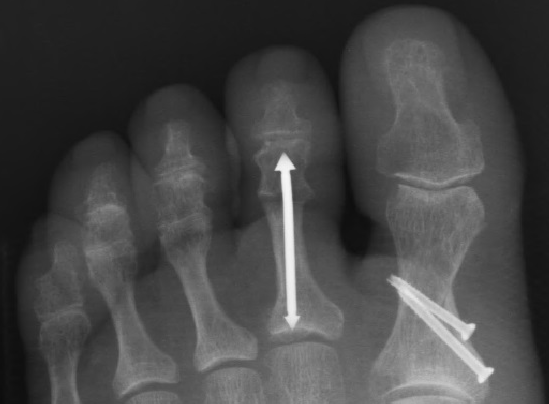 Scott RT, Hyer F. The protoe intramedullary hammertoe device: an alternative to kirschner wires. Foot Ankle Spec. 2013;6 (3)(June):2013-2015. doi:10.1177/1938640013487891. Mangram AJ, Horan TC, Pearson ML, Silver LC, Jarvis WR. Guideline for prevention of surgical site infection, 1999. Infect Control Hosp Epidemiol. 1999;20(4):247-278. doi:10.1016/S0196-6553(99)70088-X. Kramer WC, Parman M, Marks RM. 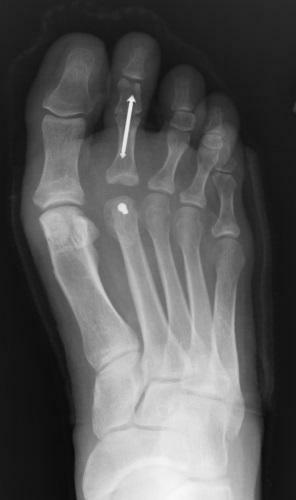 Hammertoe correction with k-wire fixation. Foot Ankle Int. 2015;36(5):494-502. doi:10.1177/1071100714568013. Feilmeier M, Dayton P, Sedberry S, Reimer R a. Incidence of surgical site infection in the foot and ankle with early exposure and showering of surgical sites: a prospective observation. J Foot Ankle Surg. 2014;53(2):173-175. doi:10.1053/j.jfas.2013.12.021. Saxena A, Fournier M, Cooper J, Spurgeon L. Rate of surgical site infection following the implementation of an antibiotic prophylaxis protocol for foot and ankle surgery. J Am Soc Podiatr Surg. 2014;(2):1-6. Brown BC, Cohen RK, Miller JR, Roman SR. Correcting hammertoe deformities utilizing an intramedullary device: case reports. Pod Inst.:51-60. http://www.podiatryinstitute.com/pdfs/Update_2013/2013-11.pdf. Accessed July 7, 2015. Arrowhead medical device technologies, LLC. 2011. http://arrowheaddevices.com/. Accessed July 7, 2015. Moon JL, Kihm CA, Perez DA, Dowling LB, Alder DC. Digital arthrodesis: current fixation techniques. Clin Podiatr Med Surg. 2011;28(4):769-783. doi:10.1016/j.cpm.2011.07.003. 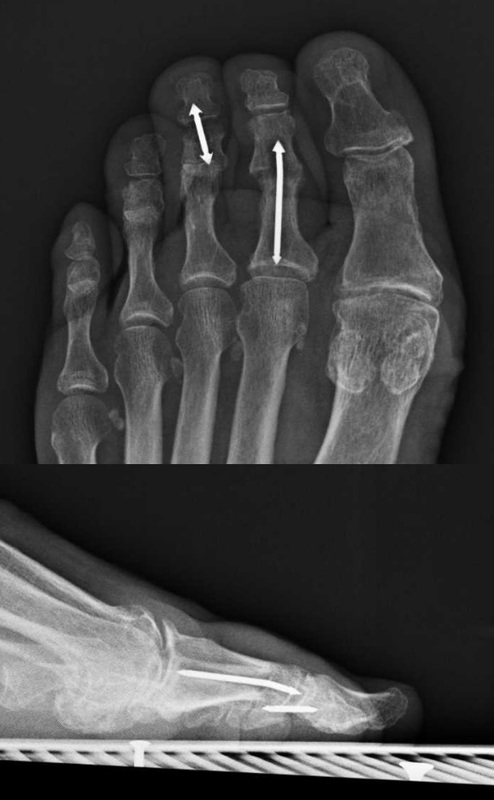 Roman SR. Surgical tips and tricks when correcting hammertoe deformities utilizing an intramedullary device for proximal interphalangeal fusion. Pod Inst.:59-62. http://www.podiatryinstitute.com/pdfs/Update_2012/2012_13.pdf. Accessed July 11, 2015. Eveleigh RJ. A review of biomechanical studies of intramedullary nails. Med Eng Phys. 1995;17(5):323-331. doi:10.1016/1350-4533(95)97311-C.
Bong MR, Kummer FJ, Koval KJ, Egol K a. Intramedullary nailing of the lower extremity: biomechanics and biology. J Am Acad Orthop Surg. 2007;15(2):97-106.